Wine | "It's Not Wine, it's Mommy Juice!" With that said, I’m a working mother — I don’t go out with my girlfriends as much as I would like to, or deserve to, frankly. So I’m often on my own when it comes to choosing wine. Here are some of the resources that I find most helpful. 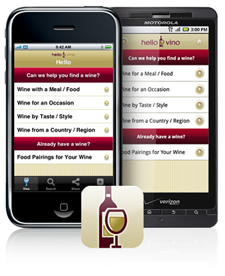 Hello Vino Mobile App – this little beauty works on all smartphones. I’m tickled, of course, that the app includes recommendations on pairing wine with both chocolate and pizza – two of my favorites in which to indulge besides wine! *smile* Best of all — it’s free! Kendall-Jackson Wine & Food Pairing Guide- KJ (we’re on a nickname basis) created a PDF chart for those of us who are not smartphone inclined. A well-worn copy of this guide resides in the side pocket of my purse. It’s handy. It’s dandy. It’s falling apart at the seams from overuse!